Ageing materials, recommendations from manufacturers and standards are all things to be borne in mind to ensure the reliability of your material over time. Eneria guarantees the maintenance of power generators, all converters and all Caterpillar energy production facilities. We can also assume responsibility for other brands, whatever their power or component parts. Based on your needs, we will guarantee the repair and complete an on-site review, or review in our renovation workshops, that observe the highest CAT standards. Our maintenance visits take place yearly, whether or not they form part of a maintenance plan. Our oil analysis programmes enable you to interpret the health of your engine so as to extend the life expectancy of its component parts. Our technicians are necessary tools working to establish diagnostic efficiency (infra-red thermographs, network analysis, etc.). 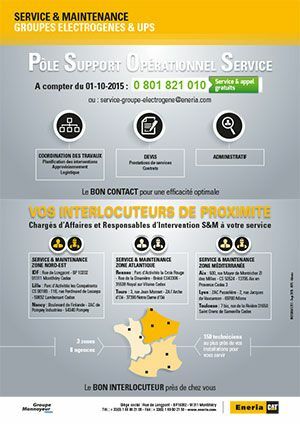 Our closeness network guarantees you rapid assistance across France for all types of work: mechanical, electric and automatic. Our technicians will help you to start up your power generators. Have technical support, which is closely related to the manufacturer, available to you. Benefit from a logistic of unparalleled spare parts. Benefit from a 24/7 on-call service with a guaranteed response time. Benefit from a remote monitoring system to monitor the performance of your centres. Benefit from an advisory, and follow-up, structure that is in line with your projects, including exportation. Whatever your facility, an Eneria maintenance contract will meet all your needs. Technical Assistance (TA) visits: visual monitoring of the facilities and main functions. Technical Assistance and Maintenance (TAM) visits: similar to TA monitor visits, complete with services such as draining, replacement filters, etc. Complete Test Visit (CTV): similar to the TAM monitor visits, complete with monitoring, such as generator security monitoring. Client satisfaction is at the heart of our converter and power generator service strategy. A daily partner in your activities, our After-Sales Operational Support Service is available to you to meet all your needs. Our teams are available to you to provide you with daily service to resolve all your problems. Contact persons, regional managers, project manager service, officers in charge will provide you with personal, daily advice, tailored to your activities, and providing solutions that will best resolve your issues. Our technicians have the best response times, especially in France, and can aid you overseas with all your maintenance operations. Plan response tasks, organise logistics (order pieces, delivery, technical assistance) and coordinate the correct running of the works. Manage maintenance contracts: enter contracts, renew them, etc. De convention expresse, les interventions mentionnées dans le présent devis sont strictement limitées aux opérations de diagnostic. En aucune façon, Eneria ne pourra être tenue pour responsable d’interventions autres que celles incluses dans le présent devis. Toutes interventions complémentaires éventuelles devront faire l’objet d’un devis séparé. Veuillez remplir ce formulaire afin de valider votre commande et obtenir un RDV pour une intervention technique. Merci de prendre connaissance des conditions générales d’intervention. Thank you for your technical assistance request !